As many of you may have guessed by my almost 10 day absence, my husband and I have been away on vacation. A friend and old teammate of my husband’s was getting married at their alma mater, Villanova, and we took a trip to Philadelphia for that. Once we started planning the trip to Philadelphia we decided since my parents would already be graciously watching our dogs and we were only a short train ride away that we would extend the trip several days and spend the time in Manhattan. The city holds a special place in our hearts… we had our first unofficial date there, we got engaged there and we both are head over heels in love with it. Our original plan was to take a later afternoon train on the Sunday after the wedding and ease our way into that part of the trip but then I discovered that the Food Network Food & Wine Festival was taking place the same weekend. 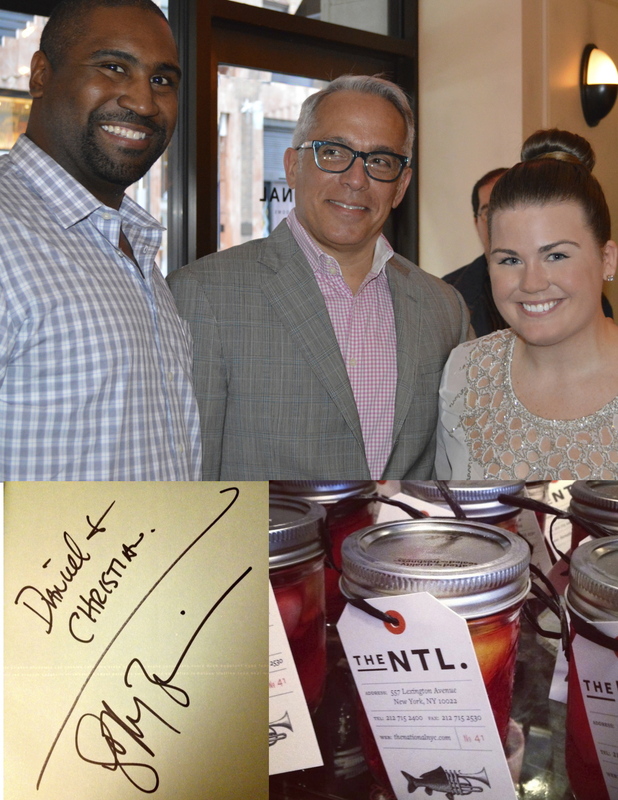 The last day was Sunday so I worried that we would miss the best events but then I saw that one of my favorite Chefs, Geoffrey Zakarian, was having an event at his restaurant The National that afternoon. It took a little re-working of the schedule so that we could leave Philadelphia sooner to get on an earlier train to make it on time but it was SO worth it. The event was not only the greatest way possible to start that leg of our trip but it was so inspiring and exciting that we left feeling totally re-energized. I usually just post my craft tutorials, tips and recipes but our time in Manhattan was so incredible that it would be selfish of me not to share all of the details! Let me paint a picture for you of how the day started for me and my husband. We had spent the last few days in Philadelphia catching up with our friends and my husband’s teammates, staying out far later than we normally do and were quite exhausted by the time Sunday morning came. We thankfully had the forethought to pack everything up after the wedding reception the night before and so we got dressed, loaded the car and headed to the 30th Street Station to catch our train. We got a little sleep on the train and were able to check into our hotel a few hours early. 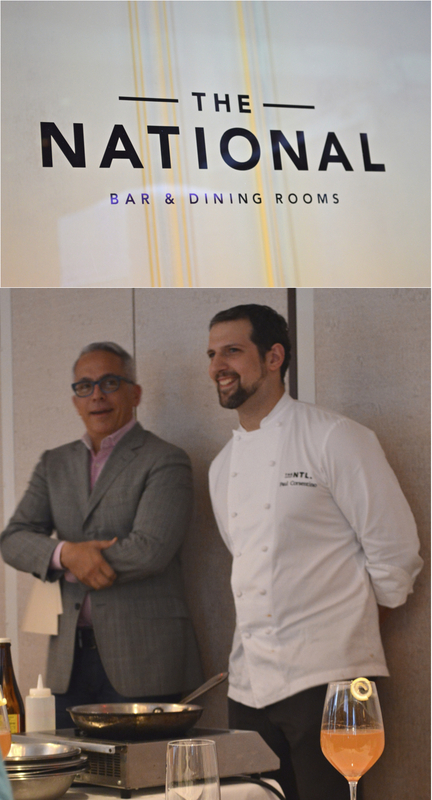 We quickly changed and hopped in a cab to head over to The National where Zakarian and his executive sous chef, Paul Corsentino, were hosting the “Get Pickled at the National” event. The thing I both love and loath about NYC is that you never know what’s going to be happening just around the city. In our case, standstill traffic that made us hop out of the cab to walk the rest of the way and New York’s Hispanic Day parade that had all of Fifth Avenue shut down (guess where we needed to cross to get down to Lexington). After all of this we finally made it with 2 minutes to spare, settled into the bar and ordered a cocktail before being ushered to the upstairs where 6 rows of long tables were set up in front of a cooking station. The thing I loved most was how intimate the event was, with just 3 rows of tables on each side of the room there was enough people to fill the room but just enough to feel like you’d be getting individual attention. 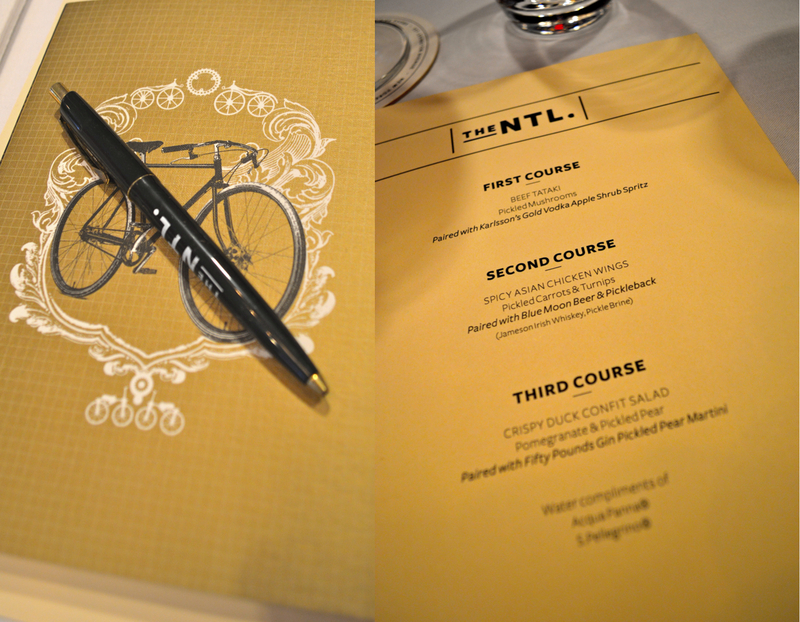 Each seat had an adorable notebook and pen for taking notes and a menu of each course that would be prepared for us. Within minutes, Geoffrey popped out from the divider between rooms and greeted us so warmly that we instantly felt at home. For those of you who don’t know who Geoffrey Zakarian is, he is an Iron Chef on the Food Network who also judges on their show Chopped and he owns many restaurants. You know when you watch people on tv and you think to yourself “I wonder if that person is the same in real life as they are on tv”? Well he is even better in person. He was a gracious host, warm, friendly, hilarious and very knowledgeable. He encouraged everyone right from the beginning to not be afraid to “be rude, interrupt and ask lots of questions”. He answered every question (from cooking to his personal life) honestly and thoughtfully, I was so impressed with him that it just made the event all the more exciting. Hosting with him was the executive sous chef of The National, Paul Corsentino, who was equally charismatic and talented… you could easily see why they work so well together! The event was all about pickling- dispelling the idea that cucumbers are the only things that can be pickled, learning that canning and preserving are not the same thing as pickling and most importantly- showing us first-hand how to do it, what food and cocktails to pair them with and that pickling is (in fact) that little thing that’s missing from a lot of our meals! The first course, Paul demonstrated a pickling technique on hon shimeji mushrooms, which are Japanese mushrooms with an umami flavor that work great for pickling because they are uniform in size. He tossed them in a bowl with 1/2 cup Japanese rice vinegar, a little ancho pepper, 1 tbsp salt, a pinch of pepper and 1 tsp sugar. You can cover the bowl with parchment and keep in the refrigerator. This was the other wonderful thing that they kept reiterating throughout the courses was that pickling can be that easy! 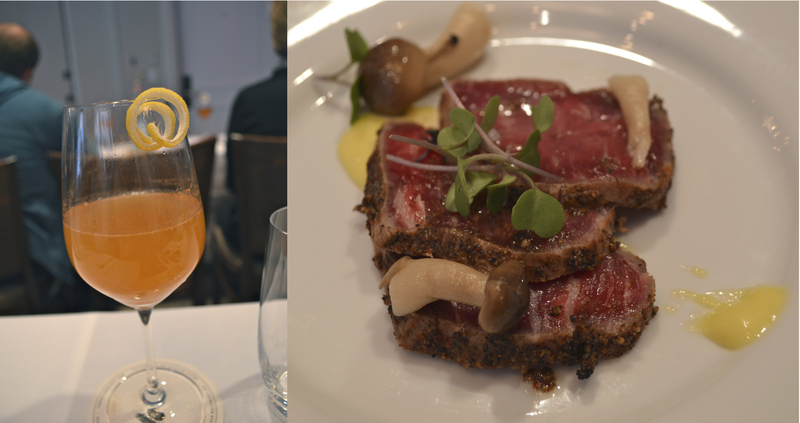 They served these pickled mushrooms with beef tataki and a vodka apple shrub spritz cocktail. The cocktail was spices and vinegar muddled with Karlsson’s Gold Vodka topped with apple spritz and ice. Once the cocktails were at room temperature they were topped with club soda. For the second course, Paul demo-ed pickling carrots and turnips. He brought 1 cup Melfor vinegar (he described it as a “fancy” french vinegar with herbs and honey) and washed and peeled about one cup of whole baby carrots. He cut each carrot once and cut the turnips into quarters. Once the vinegar was boiling, he added 1 tbsp salt, 1 tsp sugar, a pinch of fennel seed, whole black pepper corns and mustard seeds. Geoffrey suggested using the all spices whole instead of ground so that it wouldn’t become “muddy” in the pickling liquid and also pointed out that it looks cool when you jar the pickled vegetables and give them as gifts. Once you’ve added everything to the pickling liquid, including the carrots and turnips, you just cover it until it cools and you’re ready to go. These were served with a chicken wing that was delicious! They blanch the wings in seasoned water to keep in the fat but take out the “wetness” so that when they deep fry them they can be as crispy as possible. The sauce on the wings was made from sweet soy sauce, chili, lime and ginger. 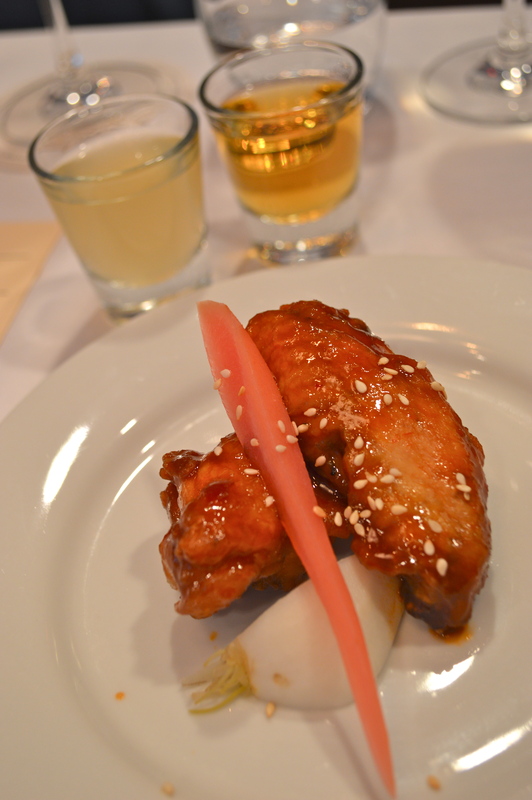 The fatiness of the wing played off the crispness of the pickled vegetables making it a decadent combination. The cocktail for this round was one of the highlights from the whole meal. We were served two shot glasses and a bottle of Blue Moon… the first shot was Jameson whiskey, the second a “pickle back” shot (turnip and pear pickling liquid mixed with a little bit of yuzu) and the beer was in case people didn’t care for the first two! A few people were scared to try it but I thought it was great… a really playful way incorporate the pickling aspect into the cocktails! The third course was my favorite, a crispy duck confit salad with a pickled pair martini. For this course, Paul demonstrated how to pickle pears. He took a slightly under ripe pear, cut it into slightly thicker uniform slices and set aside. He started with 1 cup apple cider vinegar and added a touch of citron vinegar, a tbsp of yuzu, a pinch of all spice, star anise, a cinnamon stick, indian long pepper, a tbsp of salt and a tsp of sugar.. He used the cider vinegar to keep things a little sweet so that it would play nicely off the saltiness of the duck. He brought all of the ingredients to a boil, added the pears, covered and cooled to room temperature. The pears were served in a salad of frisee and greens tossed with pomegranate seeds and duck confit. The cocktail was incredible (and I usually hate gin)… it was made with Fifty Pound Gin, the pickled pear liquid and vermouth. I was so distracted drinking mine that I forgot to snap a picture, so the picture of the martinis below is actually Geoffrey’s picture. After the last course was served, Paul and Geoffrey took the time to answer a lot of questions from all of us. I asked where in the city him and his wife (who was lovely, and also at the event) were enjoying eating lately (Bar Masa, Balthazar and BondSt) and my husband asked him if there were times he missed just being a chef as opposed to having to deal with the business side of owning a restaurant (short answer, yes). Geoffrey got asked his drink of choice (a Plymouth gin martini, dry, shaken until you can “skate across the top of it”), where the Hello Kitty bandaids came from on the Next Iron Chef (he grabbed a box from home that looked like normal bandaids, they were Hello Kitty and it stuck), where he gets his famous glasses from (a small shop owner in the city custom makes them), what kind of oil he cooks with (canola, unlike “another food network chef who wears orange shoes” that unnecessarily uses olive oil to cook everything), if he’s ever been served REALLY bad food on Chopped (yes!) and when he’s coming out with another book (he has two in the works right now). Paul got asked where he got his start (culinary school in San Francisco, then the Restaurant in Chicago, then to NYC where he’s worked at Bouley, Country, Alta, Rouge Tomate and Dumant before landing at the National), if he ever wanted his own restaurant (he’s very happy where he’s at), what kind of knives he uses (Misona) and how closely he works with the bar to pair the cocktails with the food at the National (very closely!). Once the event was over, we had the privilege of meeting Geoffrey one on one downstairs at the bar where he and my husband had a conversation about being competitive (pretty fitting for an Iron Chef and the ex NFL player, right?). We got a quick picture together and he graciously signed a copy of his Town Country cookbook for us… Oh, and did I mention that we each got jars of pickled vegetables as a thank you for attending?? We left feeling excited, inspired and most of all utterly grateful that we got to experience such a once-in-a-lifetime event. It was such a wonderful event, held at a beautiful restaurant that was made even more memorable by the talented and most of all genuine personalities of Geoffrey and Paul. I love experiences like this! Haven’t had one in a long time. Glad you enjoyed it! Yes! He was so amazing… I was interested to hear how the Iron Chef event was once you two said you’d gone to that, nice write up on your blog too! Oh that’s great! Thanks for passing the info along, I will definitely have to order some!